Pyramiden is one of the Russian settlements of Spitsbergen. Originally, the coal field was occuppied by Bertil Högbom from Sweden, but mining activities did not reach an industrial level and the property was sold to Russia in 1926. In 1931, the state-owned company Trust Arktikugol became the owner of Pyramiden, which got its name after the neighbouring mountain. In the 1970s and 1980s, the settlement got larger and had up to 1000 inhabitants. In 1998, Pyramiden was abandoned. The reasons lay in the bad general economical situation of Russia in the 1990s, lack of political support, shrinking coal reserves and finally the catastrophic airplane crash at Operafjellet in 1996, where 141 Russians on the way to Barentsburg lost their lives. After years of decay following 1998, recently Pyramiden is getting more busy and active again. In 2013, Hotel Tulipan was re-opened and in 2018, the Culture House got some renovation. But there are still no more than 10-20 people living and working in Pyramiden, depending on the season. Pyramiden is a fascinating place that has got a lot of attention in worldwide media and travel blogs in recent years, and tourists have discovered it as an attractive destination. Most come on a day trip by boat from Longyearbyen, staying for about two hours, just enough to get an impression. Some stay in the hotel, thus having more time to explore. 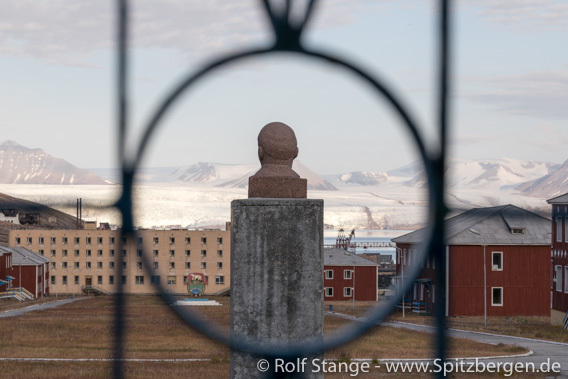 Lenin in Pyramiden, viewing towards the main avenue (Prospekt) and Nordenskiöldbreen. In my personal opinion, Pyramiden is one of Spitsbergen’s most interesting places. I have been there regularly since 1997, including the latest period as an active settlement, and I have always been fascinated. Next to the bizarre place itself, the surroundings are of great scenic beauty. Polar bears are regularly seen in Billefjord and they do come into the ghost settlement every now and then, so Pyramiden is not polar bear safe! If you want to go and explore on your own, you need to take the usual precautions as anywhere else in the wilderness, which means you need a suitable weapon and scaring devices and you have to be able to handle them properly also when under great stress.